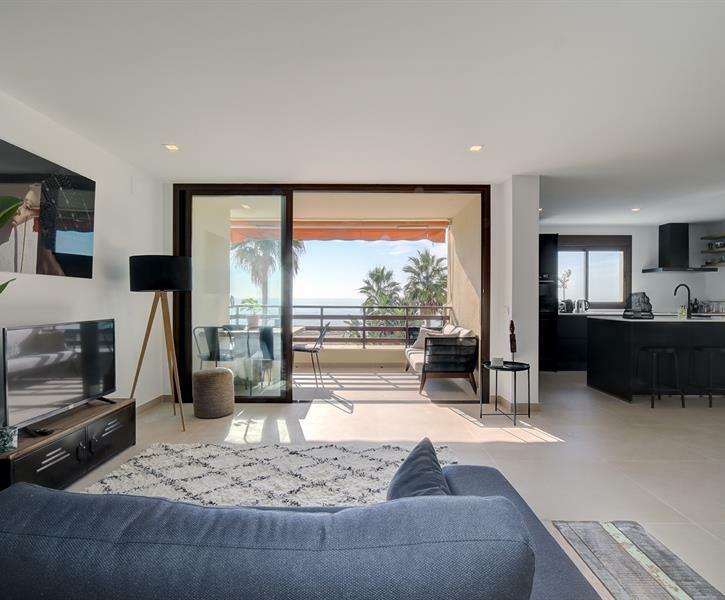 Neu renoviertes Appartement im Zentrum von Estepona direkt am Strand mit herrlichem Blick auf Gibraltar und Afrika!. Vollständig möbliert. Alles ist da. Wenn etwas fehlt, werden wir dafür sorgen, dass es dort ist. This is a very well appointed apartment in a superb location. There is no busy road between the apartment block and the beach. There are lovely walks along the promenade and the beach, and the weather was sunny and warm in January, so we made the most of the spacious balcony. There is a variety of cafes and restaurants a short stroll from the apartment and it only takes two to three minutes to walk into the old town. We were in Estepona to relax and enjoy the slower pace of life. We went to an authentic flamenco and guitar evening which was packed with local families and we felt very welcome. We visited the Orchid House, and as recommended walked through the town visiting the plazas, the market and viewing the murals en route. Tom and Mieke were brilliant. They were welcoming and friendly and keen to help with anything. We would recommend the apartment to any of our friends.